Give me a sense of what the tone is. If a modern secular reader ... sat down and read it through for the first time, my guess would be they would find it to be extremely violent. Someone once tallied up the death count and projected it on a modern world such as ours, with five billion people, and it's absolutely a horrible kind of a statistic. You come up with maybe four billion dying of famine, war, earthquake, plagues. Can you convey the atmosphere of Book of Revelation? Fredriksen is a William Goodwin Aurelio Professor of the Appreciation of Scripture at Boston University. Gallagher is the Rosemary Park Professor of Religious Studies at Connecticut College. As soon as the Book of Revelation is written it makes a synthetic whole of apocalyptic ideas available to readers. It accumulates bits and pieces and puts them into an accessible sequence of events. Then the question becomes simply to match up its admittedly vague utterances with historical events. When it doesn't seem to accurately predict the end at its time of writing, it gets taken up again in the second century by people like the Montanists. It gets taken up in the Middle Ages by all kinds of people, and it gets taken up very prominently in the contemporary period by Protestant Evangelicals like Hal Lindsey, whose book The Late Great Planet Earth, is one of the best selling religious books ever, if not the best selling religious book. So it essentially offers an arsenal of apocalyptic images and predictions that can be used to target any specific time as the apocalyptic moment. The Book of Revelation in the New Testament has the literal title in Greek, the "Apocalypse of John." The word apocalypse means revelation. That which is uncovered. It comes from the Greek word which literally means to pull the lid off something. So that which is revealed is central to the way that apocalyptic literature works. ... The word "apocalypse" refers to a genre of literature like the Book of Revelation itself. They are pieces of literature that start by revealing something or seeing visions or having individuals be taken up into heaven where they can see what's going on from that vantage point. Scholars also talk about "apocalyptic" or "apocalyptic environment," or "apocalyptic outlook." In this sense the word "apocalyptic" has a slightly broader meaning, and it refers to the spirit of the age that especially became prominent roughly between the years 300 B.C. and 200 C.E., the very years in which Judaism itself went through some cataclysmic changes, when the Temple was destroyed once again and importantly when the Christian movement itself was born and Jesus was executed. The Revelation of John, the Apocalypse, also must be looked at from the perspective that it's not the only such piece of apocalyptic literature that we have. In fact there are lots of apocalypses. Some thirty or forty of them from the ancient world that we know by name and we can actually read still to this day. ... So when the author of the Book of Revelation sat down to write, there was a very strong paradigm of what revelation literature should look like and sound like. The stock of characters, the list of images, the symbols one uses are pretty commonplace, if you're in that environment. Does John have, in Apocalypse, an attitude towards the imperial cult? Collins is a professor and serves as chair of the Department of New Testament and Early Christian Literature for the University of Chicago Divinity School. John was different from many other Jews and Christians who kind of overlooked the pagan worship of the emperor and developed their own version of imperial cult, which was basically obedience, trying to be a good citizen in the Roman empire and praying for the emperor. John, on the other hand, took the position that Roman power was illegitimate and that the worship of the emperor was idolatry. The image of the Harlot of Babylon--in effect what he is saying is that Roma is not a goddess, she's a whore. That, I think, encapsulates his attitude, his very belligerent and pejorative perspective, on Rome and its institutions. How exactly did Babylon become equated with Rome? What is the structure of the Book of Revelation? One of the difficulties for people now who try to read the Book of Revelation is that it's not written as a kind of linear story. This is especially difficult for people who try to use it as a prediction of historical events in the future. It doesn't work so that things at the beginning of the story are necessarily in order one after another leading to the end of the story. The way the Book of Revelation is actually written is as a series of kind of unfolding revelations, each one of which gets to something deeper in the story. Basically there are three sections after the letters to the seven churches. 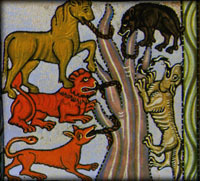 The first section is in chapters 5 through 11, and in this we have John being shown a series of visions symbolized by the seven seals and the seven trumpets. But if we kind of look at how these things are working, each one is a box within a box, it's sometimes really thought of that way, as a series of Chinese boxes. You open the seals and when you get to the sixth seal things are looking really bad and when you get to the seventh seal we find that the seventh seal is actually the seven trumpets and we start all over again going deeper and deeper into the story. Then when we get to the seventh trumpet in chapter 11, the trumpet blows and heaven opens and you see the revelation of the dragon and the woman. ... So chapters 12 through 14, the woman and the dragon and the beast, really is centerpiece of the story. And it is the underlying cosmic drama that John is showing, which reveals the principals, the combatants upon which the rest of the story is being played out. What's not in the Book of Revelation? Sometimes people are surprised that when they actually read the Book of Revelation of what's not there. Things that are typically associated with end time prophecies and typical language actually is not found in Revelation at all. ... Notably there's no reference whatsoever to the Antichrist. That terminology only shows up in two places in the entire New Testament. One time in First John and one time in the Second John, but not in the Book of Revelation itself. The other terminology that [is] sometimes thought to be in Revelation is the Rapture, that is, the snatching away of Christians just at the last moment before the Tribulation occurs. That, likewise, is not actually in the Book of Revelation itself, that actually comes from a passage in First Thessalonians. 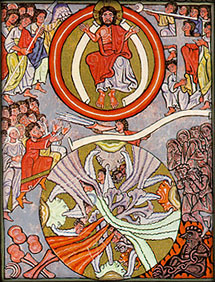 And so what we have to realize is that in some interpretations of the Book of Revelation--in fact most of them--the interpretation is created by bringing things into the Book of Revelation, into its scheme, that are not actually there and reading them as a kind of a jigsaw puzzle of eschatology and last judgment. What did John expect when he talked about new heaven, new earth, new Jerusalem? The end of the Book of Revelation sees a new heaven and a new earth coming down and a new Jerusalem being established ... . What John seems to be suggesting in the original meaning of this work is that when the triumph of God comes over the dragon, over the forces of the devil, and the Roman Empire is toppled, a new heaven and earth will be created ... and that's the kingdom coming on earth. ... [He] anticipated a rebuilding of the real city of Jerusalem as part of this eschatalogic expectation. So John is looking for Jerusalem to be re-established soon, a new Temple to be built soon, and for this to be the symbol that God's kingdom is finally being established on earth, a pure kingdom of goodness in contrast to the kingdom of Satan that has been destroyed in the person of the Roman emperor. Montanus was a Christian living in the latter half of the second century of the Common Era, somewhere between 160 and 180, roughly. He's from an area of modern day Turkey called Phrygia ... . Montanus at some point comes to the realization that the world is about to end, or that things are getting bad, just like the Book of Revelation seems to predict. ... What leads him to this? Well, we know in fact that there's a massive plague that breaks out in 160. In fact, it's the first time that smallpox enters into the western world just at this time. They don't know what to call it, but they know it's devastating and [it would be] the kind of plague that the Book of Revelation seems to describe. He takes that and other kind of indicators to suggest that the end times are near. Montanus believes quite literally that Jesus is returning soon and will inaugurate a thousand year reign on earth. ... He seemed to expect that literally a new Jerusalem would descend physically out of heaven and land on a mountain top in central Turkey at his own town ... . Needless to say, it didn't quite happen that way but, nonetheless, a number of followers were attracted to it. The key point is John's Revelation is not mainstream, and, right from the beginning, was rather seen as subversive to authority, and a dangerous book, isn't that how it was seen? Within only a couple of years after the thousandth anniversary of the founding of Rome, something else begins to happen that sparks Christians' attention. The Emperor Decius proclaims an empirewide sacrifice, and this really is the event that for the very first time will be the occasion of persecution of Christians throughout the empire. All Christians are expected to sacrifice or be liable to imprisonment or death. So the question will be--will they sacrifice to the emperor or remain faithful to Christ? And so, in the light of that kind of expectation of what they should do, reading it now in the context of the Revelation of John, on the heels of the first time a thousand becomes a significant number in their experience, some people at least in the Eastern part of the empire begin to say, "Wait a minute, this looks like things that John predicts for the end of time." As long as the empire was pagan, Rome could be an historical stand in for Babylon. After all, that's what the text of apocalypse says. The awkwardness for Christianity, with its own apocalyptic heritage, comes with Christianity's political success. When Constantine converts to one, remember, just one form of Christianity ... in 312, from the perspective of John, the writer of Apocalypse, the beast has entered the church. But from the point of view of Eusebius, one of Constantine's Bishops, it's God's working in history. It's the revelation of the messianic peace that Isaiah talked about. From Eusebius' perspective--I mean we're used to thinking of the empire being Christian, they weren't, it just happened in their lifetime--this is an unthinkable thought and yet it occurs. So Eusebius, looking at these traditional apocalyptic texts, knows that the traditional apocalyptic reading has to be wrong, because now the empire is Christian. ...The empire isn't God's opponent, and therefore, interpretations that look at these text as speaking about God defeating the evil empire of Rome are clearly wrong interpretations, because now God's servant is himself the emperor. So what Eusebius will do is, he's one of a number of Christians who begin to discredit an apocalyptic frame of mind, now that Christianity, in a sense, with the consolidation of power under Constantine, settles down into history. Apocalypticism, for people who are prepared to settle down into history, is something that is old fashioned, is clearly wrong and is therefore heresy. Is there a move to exclude Apocalypse from the New Testament? The Book of the Apocalypse has a checkered career in the history of the New Testament canon. Canons themselves are local. In some places in the empire, Apocalypse is in the collection, in other places it isn't. ... Different cities have different gospels, and there is no central power, so there is no single agreed upon canon. What you get when you have the Constantinian revolution is a principled opposition to the Book of Apocalypse. Once the weight of communities decide that the book is going to be kept in the collection, then your option is no longer to drop the text, your option is to reinterpret it, and that's what people do next. When does John's view of the Roman Empire, the evil empire, become most in conflict, if you like, with the majority of Christianity? When does it become a real embarrassment? The apostle Paul, in Romans 13, advocated obedience to Rome. And advocated living quietly in peace with non-Christians in the Roman Empire. John advocated resistance. Other letters in the New Testament advocated peaceful coexistence. So John's book was likely controversial all through the time that Christians were not an officially recognized or legitimate group. Once Christianity became legitimate, and recognized by Constantine, then the Book of Revelation was a problem. Because one didn't want to insult the city of Rome or the Roman emperor. And it's very interesting the reinterpretation that occurred at that time. Instead of being read as a dichotomy between God and Christ as ruling in heaven, and eventually on earth, and this evil Roman power on earth in the meantime, there came to be a compilation of the two. That the Roman emperor came to be seen as a representative of Christ. And Christ came to be understood as, as ruling on earth through the current political system. Probably more than any other figure of the early Christian period, Augustine of Hippo is one of the leading thinkers ... . His importance really cannot be underestimated for the reshaping of Christian tradition. It is largely to the work of the Augustine that we owe the fact that the Revelation of John is even in the New Testament at all. What Augustine does by helping put the Book of Revelation in the Bible really accomplishes two things. One, he provides what will become, at least eventually, the normative reinterpretation of the book by reading all of the symbolism in it as just that, symbolism and not literal history. Now, that doesn't happen overnight, but his view is the one that will eventually carry the day throughout most of later Christian tradition. But doesn't putting this book right at the end suggest that the end of the world is yet to come? In Augustine's reinterpretation of the Book of Revelation what this actually does is to say that the symbolism, all the vivid elements that some people before had been taking literally, none of them were literal. He did not believe in a literal thousand year reign. He did not believe in a literal figure that would come as a kind of Antichrist or any thing like that. What he says essentially is that all of that ... is really about the church, it's the church that is the thousand year reign of Christ on earth, beginning at the resurrection of Jesus himself. And the symbolic thousand years will come to end only when Christ returns at the end of the world and takes the kingdom away to heaven ... . The crucial term in Augustine's interpretation is he sees, in the Book of Revelation itself, that there are two resurrections. The one resurrection that comes at the beginning of the thousand year reign and another resurrection when Christ comes again and establishes the new Jerusalem. 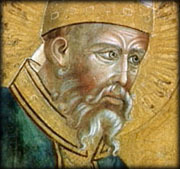 Augustine. though, takes that to mean the first resurrection is when one is born into the church. For him, symbolically the thousand year kingdom on earth is the church, so when you're going into the church that's your spiritual resurrection into the kingdom. But the second resurrection will be the one that comes at the end of the world, when Christ literally does come again and ... establishes finally his new heavenly kingdom. For Augustine, the new Jerusalem is explicitly and exclusively a heavenly Jerusalem, not an earthly one. To join Christ there is to ascend into heaven. But before one can do that must come the resurrection and the judgment by Christ. He then takes the story of the judging between the sheep and goats in Matthew 25 where Jesus sits in judgment ... and says that's the scene that will take place when Christ comes again to establish the final kingdom at the end of the world. Is there any reference to judgment in the Book of Revelation? ... Augustine uses the sense of a final resurrection and a final judgment as we find it in the Book of Revelation, especially in chapter 21, as the occasion we're talking about: Christ coming at the end of the world to judge the quick and the dead. How important was Augustine's conclusion about the final judgment? For the rest of Christian history, this notion of a final judgment at the end of the world where Christ himself comes back to sit enthroned and read out judgment to the good as well as to the evil, will become the major expectation of all Christianity thereafter. And [the] Augustine synthesis really is the one that establishes that connection for later Christianity. How has the Book of Revelation been interpreted through Christian history? The complexity of the structure of the book and the difficulty of interpreting it is something that many Christians have tried to deal with throughout the subsequent centuries. In part, it is maybe even more problematic because the expectations of John of an imminent overthrow of the Roman Empire within only three and a half years didn't come to pass. The Roman Empire lasted for a great deal longer, so how do we understand this? How did Christians think about it, in the light of the fact that this claims to be a revelation from God himself given to John ... ? What is the central message of the Book of Revelation? Collins is a Professor of the Hebrew Bible at the University of Chicago Divinity School. To what extent is the Book of Revelation a political tract? Well, in the ancient world, when early Christians were interpreting the book, there was one group who read it as having to do with this world and who read the messianic reign as having to do with a pleasure, with a great feasting and fulfillment of the promises, reward for the faithful, and this involved the downfall of Rome. And there were others who thought that that kind of reading was unworthy. It was too material, too self centered, and they were the ones who initiated what we would call an allegorical reading, as a struggle between good and evil in general, not good and evil in particular. In [that] sense the book is a political tract. And I think that's one of the strengths of the modern fundamentalist readings. Hal Lindsey and his ilk. They see that it's about politics, whereas the more spiritual mainline church reading misses that aspect. Is the Book of Apocalypse a unique work? The Book of Revelation is not a unique book. It does belong to a tradition of apocalyptic writing, which began in Judaism in the Second Temple period. So the Book of Daniel would be the only other apocalypse in the canon, but there were many other books from about the same period that shared this literary form in this perspective. ... The prophetic books are based on the idea that God selects certain human beings to speak to and to send them out as spokespeople for God. The typical literary form of a prophetic book is an oracle. "Thus says the Lord." And then an announcement of God's word. It might be an announcement of judgment, or an announcement of salvation, or an admonition, an ethical admonition. And the apocalypses tend to be less straightforward. Less a simple proclamation of God's words spoken to an individual, and more complicated, more of a narrative. And apocalypse is a kind of narrative account of how revelation came to the seer. When some people hear the word prophetic, they think it means something in the future, what's going to happen next. Prophecy and apocalypticism share a hope on the future, and theologically speaking, in the twentieth century, many mainstream or liberal pastors and theologians have argued that prophecy is not primarily prediction of the future, it's much more an advocacy of certain moral positions. For example social justice for the poor. But I think that prediction of the future is an important element in prophecy. ... That's not all they are, but that's an important element. And John's Apocalypse is in some sense prophetic in the usual sense of the word. Can you describe the way in which some people, literalists if that's the right word, read the book quite literally? On the one hand the Book of Revelation I think needs to be taken seriously as grappling with history and with actual events, but a fundamentalist or dispensationalist reading tends to impose a schemer on the text that isn't there. I would say that [with] Hal Lindsey, for example ... the problem is not so much that he reads it literally, is that he reads it in a kind of flat way. That he sees the images as simply code language for certain events in the future, and misses the overtones of symbol and myth.